Like all of us, kids allow their selfishness to get in the way of a good friendship. Grace To Hugh & Hullabaloo At Hunker Hill is the latest in a series of Paws And Tales DVDs, featuring 2 episodes. Grace To Hugh – “I know who set fire to the Collins Mansion!” C.J. discovers a clue that unlocks the mystery of how the fire got started. Now Mrs. Collins must figure out how the culprit should be punished. Find out how showing a little grace can change a hardened heart! Hullabaloo At Hunker Hill – Hugh brags that his soapbox derby car is the fastest and dares Staci to drive it and see. Never one to back away from a challenge, Staci takes the car out for a spin… a spin that turns into disaster at the bottom of Hunker Hill! Was it sabotage or an honest mistake? Now The Club must decide whether to get their revenge or forgive. Approximate total running time is 45 minutes. Goliath, King of Shadow Valley is a moving story of how God transformed an angry "Goliath" into the gentle mentor, Paw Paw Chuck. Join your friends from Wildwood as they discover how Paw Paw Chuck became a new creature in Christ. All 29 episodes in one collection! Now you can enjoy all of the fun, adventure, and music from Paws & Tales’ first season. Paws & Tales has quickly become a favorite for kids of all ages. Memorable stories with meaningful lessons make each episode a timeless classic! 24 more episodes your family will cherish! Follow C.J., Staci, Gooz and the rest of The Club as they discover more about our great and loving God. This set also contains the critically acclaimed retelling of The Story of Esther. Your Wildwood pals are back for more adventures and for growth in God’s Word in these episodes from Paws & Tales’s third season. Includes the story of Saul—the first king of Israel, and the story of how being the captain of one’s destiny is a shipwreck in the making. Your whole family will treasure this collection of stories and songs reminding you that Jesus came to save and give us a life abundantly. Join your friends in Wildwood for a Christmas to remember. Experience the tragic story of a nation in rebellion and the man chosen to lead them. This version of the classic Bible story is a great tool for teaching about the dangers of pride and the blessings of obedience. Paws & Tales is known for wonderful songs that help reinforce the lessons learned in each episode. This collection of music from the program masterfully blends solid biblical teaching with fun melodies, diverse musical styles, and memorable lyrics sure to have your family singing about our great and loving God! Your old friends are back for some new adventures! 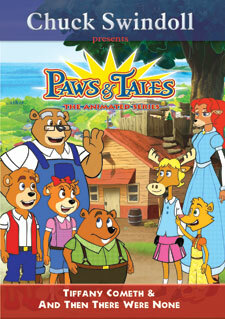 Paws & Tales—The Animated Series™ has been re-created for preschool-age and early elementary-school-age audiences. Based on the popular radio program, this new collection of animated videos offers solid Bible teaching infused with laughter and lovable characters. Order your two-episode DVD today!